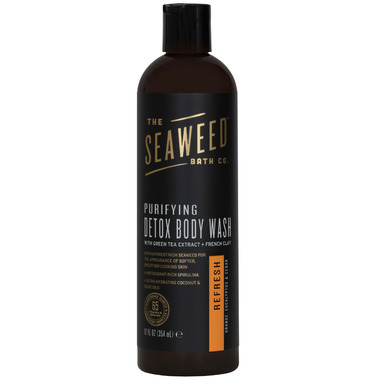 The Seaweed Bath Co.'s Purifying Detox Body Washes combine nutrient-rich bladderwrack seaweed, green coffee extract and French clay to detoxify and cleanse for softer, smoother-looking skin. Orange, Eucalyptus & Cedar essential oil blend. Best for those who want a daily wash that cleans, detoxifies and nourishes skin. Antioxidant-rich green coffee bean extract helps to detoxify and protect the skin against damaging free radicals. Spirulina nourishes with Vitamins B1, B2, B3, copper, iron, magnesium, potassium and amino acids. Coconut oil, loaded with healthy fatty acids and vitamin E, provides long-lasting hydration. Bottle is 100% post-consumer recycled plastic. Alternate with Exfoliating Detox Body Scrub as needed. Follow with our Firming Detox Cream. Directions: Use daily as a body wash or shaving gel. Gently massage into wet skin to create a moisturizing lather. Rinse clean. Alternate with Exfoliating Detox Body Scrub as needed. Follow with our Firming Detox Cream. Ingredients: Aqua (Water) with Fucus Vesiculosus (Organic Bladderwrack Seaweed) Extract, Sodium C14-16 Olefin Sulfonate, Aloe Barbadensis (Aloe), Sodium Laurylglucoside Hydroxypropylsulfonate (vegetable derived), Cocamidopropyl Betaine, Cocos Nucifera (Coconut) Oil, Azadirachata Indica (Neem) Oil, Olea Europaea (Olive) Oil, Spirulina (Blue Green Algae), Montmorillonite (French Green Clay), Vegetable Glycerin, Coffee Extract, Castile Soap, Camellia Sinensis (Green Tea) Leaf Extract, Coffea Arabica (Green Coffee Bean) Extract, Decyl Glucoside, Citrus Aurantium Dulcis (Sweet Orange) Oil, Eucalyptus Globulous (Eucalyptus) Essential Oil, Allantoin, Citric Acid, Juniperus Virginiana (Cedarwood) Oil, Potassium Sorbate, Ricinus Communis (Castor) Seed Oil, Sodium Benzoate (natural version), Gluconic Acid (plant derived), Glycol Stearate, Orbignya Oleifera (Babassu) Seed Oil, Eugenia Caryophyllus (Clove) Oil.